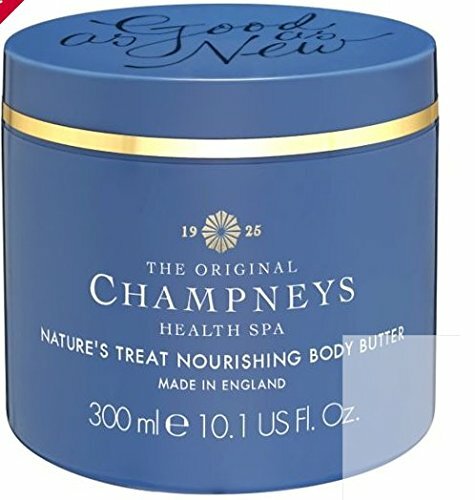 Champneys Nature’s Treat Nourishing Body Butter 300ml. A spot of nature, whether at our spas or elsewhere in the English countryside works wonders for the senses. Our body butter combines a comforting blend of honey, warm almond and soft musk scents with shea butter, cocoa butter and grape seed oil to leave skin soft, smooth and moisturised. For best results: After bathing or showering, towel dry and scoop a generous amount of body butter into your palms. Gently massage into skin, paying particular attention to dry areas such as knees and elbows. Allow to soak in before dressing for truly nourished skin. Our body butter combines a comforting blend of honey, warm almond and soft musk scents with shea butter, cocoa butter and grapeseed oil. For best results: After bathing or showering, towel dry and scoop a generous amount of body butter into your palms. Gently massage into skin, paying particular attention to dry areas such as knees and elbows. Allow to soak in before dressing for truly nourished skin.